You will learn step by step how to turn your photographs into goolishous digital works of art using PhotoShop digital software. This lesson will center around making poster style artwork. Since Halloween is creeping up on us, our theme will be Scary spiders. 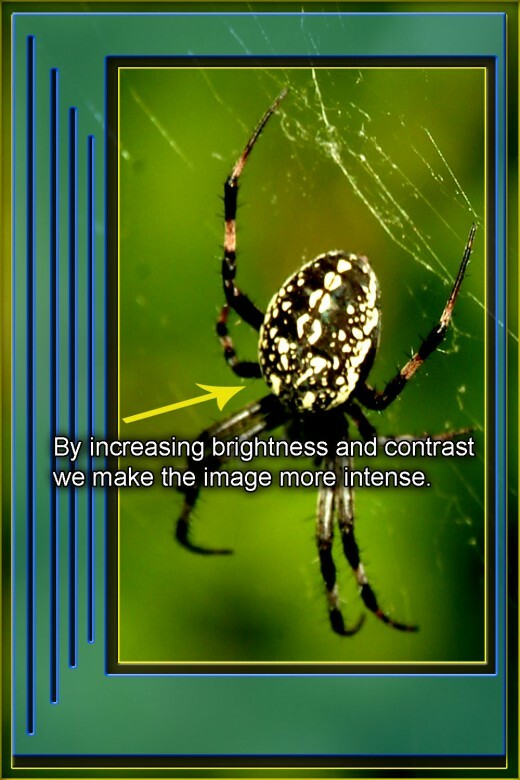 You will learn how to turn the average snapshot of an average spider into a very scary piece of art in just a few minutes. All you need is Photoshop and a bit of technique; which you will be learning here today. 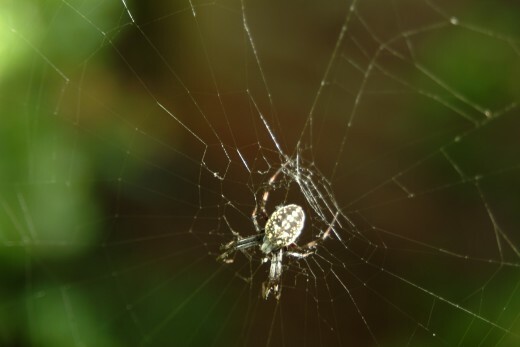 The first step is to go and take a snapshot of a spider any spider will do; if you can incorporate a portion of the web even better. The important thing is make sure that your focus is sharp and that the spider can clearly be discerned from the photograph’s background. That’s it. No big deal. Load the picture onto your computer in a file named “bighairyspider.jpg” (or something you can easily remember). Now save it where it can easily be found. Open your photoshop program and start a ‘NEW’ file. Name it and choose a canvas size of 4”X6” for our purposes today. You can build a larger file once you have your design technique in place and are ready to print out a poster sized copy of your work. The most important thing to remember when creating art for printing is to account for the pixels-per-inch (ppi – also referred to as dots-per-inch or dpi). I highly advise using at least a 300 dpi file size and as high as 600 dpi when printing for a poster size output. Anything less and the quality of the print will hardly be worth your time. Along these same lines, make certain to create your work using the color pallet CMYK (cyan, magenta, yellow and key—or black) when designing for tangible ‘real’ prints of your art; while the RGB pallet (red, green, blue) should only be used when working on web-only images. This will significantly effect the quality of the image output as well. When working on web-only art, the dpi can be reduced significantly. I usually work at around 125 dpi. Arguably, some will claim you can work at 75 dpi with good results. I choose to stay in the 100+ range and as high as 200 dpi. It’s a quality issue that works well for me. If you don’t want your work high-jacked by someone else to claim as their own (yes, this happens regularly and is really bad form for anyone to practice, it is also very illegal), then you will want to copyright your work. Did you already know about dpi and copyright watermarking? I knew about dpi, but not watermarking. I knew about watermarking, but not dpi. Yes, I have heard of both. Nope, I had no idea about either one. Now that you have your file named and your canvas size determined you are ready to start the fun part, making your photograph into poster art. First, retrieve your bigscaryspider.jpg file by ‘opening’ it. It should pop onto your screen. Using your rectangular marquee tool, isolate the portion of the picture you wish to work with. Copy (cntrl +C) the image section and paste (cntrl + V) into your new blank canvas. Using your Move tool (Arrow) grab the corner of the pasted image and adjust the size to fit your canvas appropriately. A window will pop up asking if you want to apply the size change, you do, so ‘apply’ the change. Go to the tool bar topic ‘layer’ and drop down choosing ‘duplicate layer’; rename this layer- copy ‘frame’. A new layer of the same image has just been created. It is now adjustable and independent from the first layer. Go back into the ‘layer’ tool and choose ‘layer style' this time. You will see a drop window offering you several choices to use in the modification of the new ‘frame’ layer, choose ‘color overlay’. When you choose color overlay the default color will appear over your frame layer. You will see a slider bar that is labeled ‘opacity’, reduce this to 47%. You should now be able to see ‘through’ the color layer revealing the image underneath. 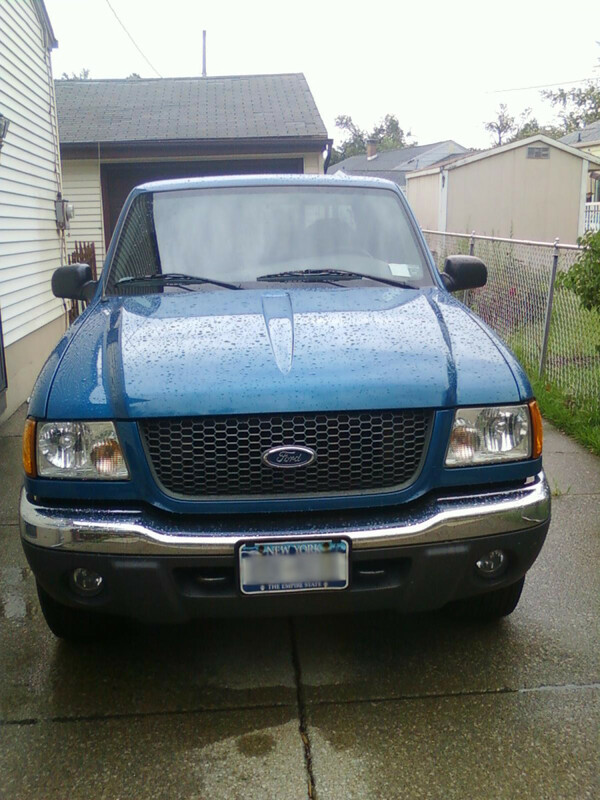 You can at this point change the color over lay color from the default color to the one you want. To do this by, opening the color pallet and clicking on the desired color. You have now determined your frame color and should see the change on the frame layer; now let’s create the actual framing effect. The idea in creating the framing effect is to give the layer depth and define that it is on its own; independent yet part of the art work as a whole. We accomplish this using a few layer style applications. You should still be looking at the ‘layer style’ window. If not, drop down the window. Choose the ‘bevel and emboss’ option. You have many to choose from, inner bevel, outer bevel, emboss, pillow emboss and so on. Decide which to use (I chose inner bevel to give more frame and separation effect). Next, chose the ‘stroke’ option. Decide on your color and size and opacity. Finally, choose the ‘drop shadow’ option. This is the most important effect for the frame application in my opinion. It gives the feeling of dimension and needed depth, causing your viewer to believe they are looking at a dimensional image. Save your work. I save my work frequently to protect against work loss when mishaps or computer behavior problems happen. You never know when a computer may have a hic-up and you loose all of your unsaved work. Oh! Now I See the Frame Effects! Now that you have applied all of the frame effects to the frame layer, we can cut out our actual frame. Up until now, you haven’t been able to really see what you have been creating in terms of the frame effect. Once you do this next step, your frame will appear right before your eyes. 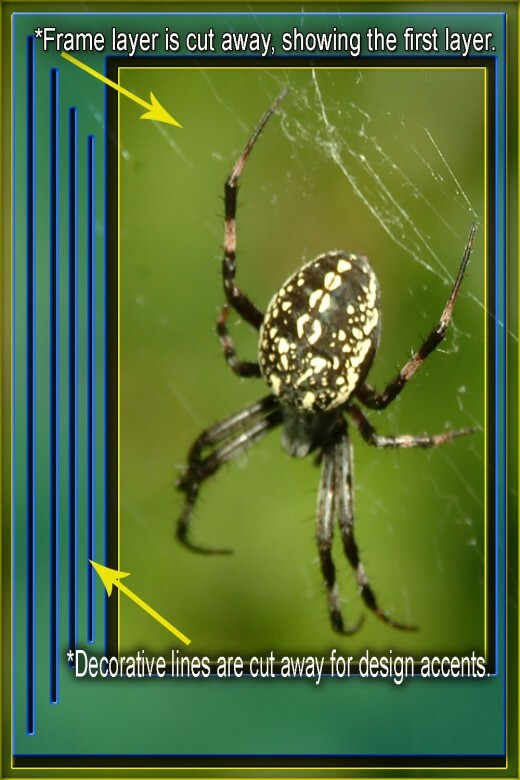 Again, choose the rectangular marquee tool and draw a box around the spider within the frame layer (you should still able to see the spider through the color over lay). Now ‘cut’ (cntrl + X) that section out of the picture, WA-la! The accents and decorations are quite apparent and the styles you applied to the frame layer show them selves. You can now see your frame effects causing the frame to pop right out of the image. Cool, huh? Save your work. Now we embark on the best part of our photo shop design. We have the frame layer in place with all of its neat accents and special effects. At this point we are going to return to our first layer, the spider picture that has no color overlay applied. Choose this layer (layer 1) make certain that you are on layer 1 or you will be altering your frame layer, and you don’t want that . 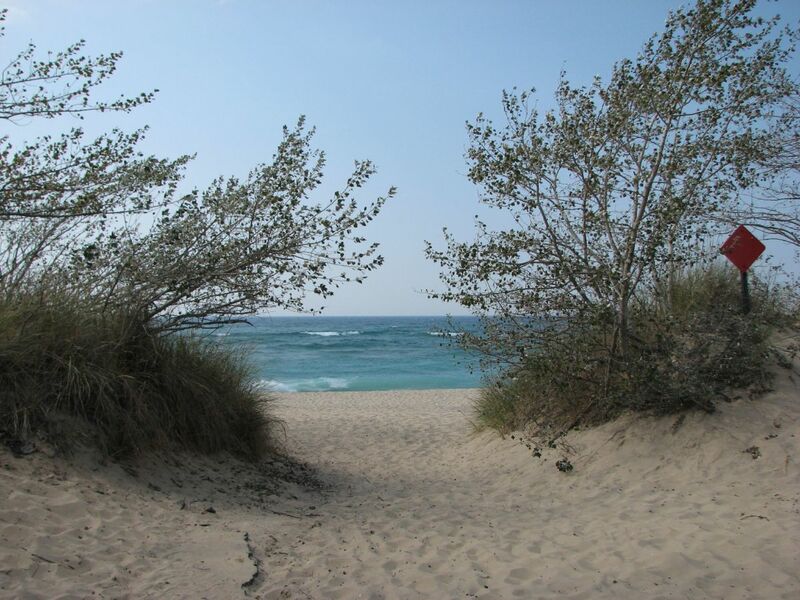 Choose the ‘image’ tool on the photo shop task bar (usually on the top bar at third from left), in the drop window choose ‘adjustments’ and then in that drop window choose ‘brightness and contrast’. One of the easiest ways to create drama or intensity within any image is to adjust the brightness and contrast, to the extreme . Since you are trying to create a scary Halloween spider poster, go for it! The thing I have found most effective, is to reduce the brightness a little bit and then increase the crap out of the contrast . 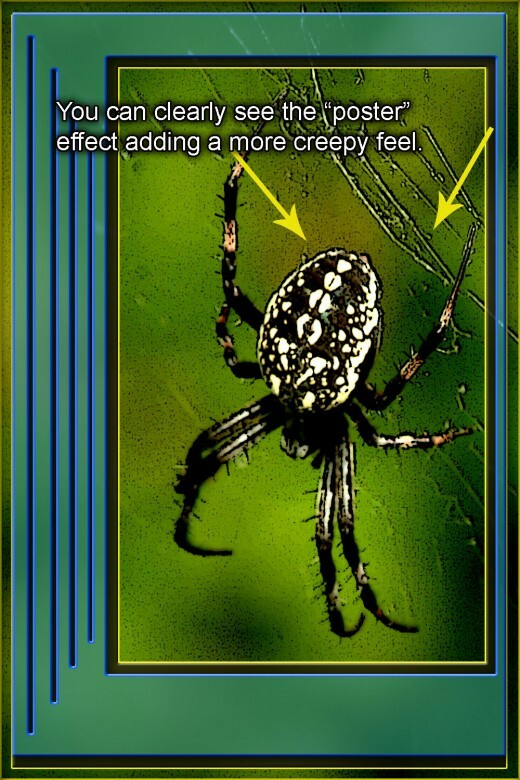 When the filter (Poster edge) is applied, it gives a very spooky look to spider images in particular. Using PhotoShop filters, a beginner can create creepy effects easily and quickly. The ‘poster edge’ filter will be applied to layer 1. To do this, choose the ‘filter’ tool on the task bar (usually 6th task from left). Within the drop window, choose the ‘artistic’ filter option; in that window choose ‘poster edges’. A new and independent window will pop open giving you choices to adjust the edge thickness, intensity and posterization. It will also let you preview the effect the applied filter will have on your digital art layer 1 instantly. You should have the ability to (+) or (–) the zoom ratio to see how the changes in the three adjustment choices will effect your big hairy spider layer. Here is where your artistic nature comes into play, adjust the poster effects until you are satisfied with the look of that scary layer. Hit ‘ok’ and you will watch the posterization appear on layer 1 spider. Save your work. 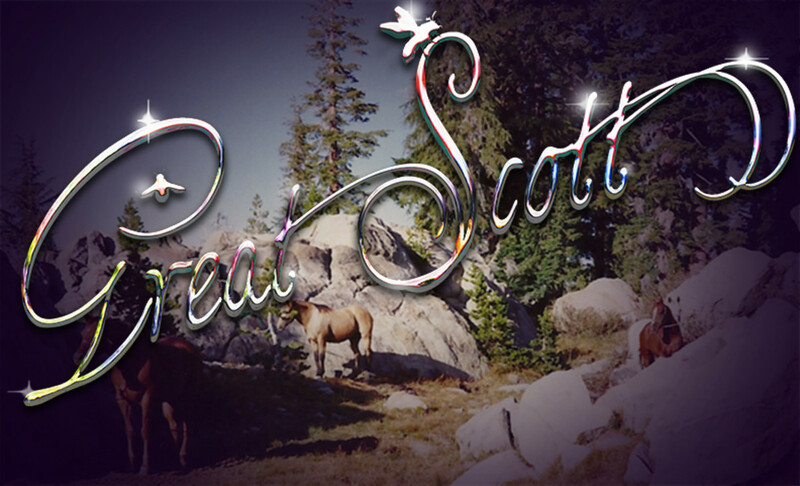 By adding text to your digital art, even a "Beginner" can evoke greater emotion. Adding text to the work helps the final photo shop project feel more like a poster. You know, every poster seems to have something to say. I also find that I can add better appeal to the art by using the same cut-out technique we used when creating the frame layer. I use very thin lines to add texture and detail to the frame itself. You can play around with this technique (even by adding additional layers if desired) find a look that you like and then fit it into your project accordingly. When adding text keep in mind the style of your work. In this PSD project we are striving for a scary feel. Choosing a spooky Halloween font can make all of the difference between your poster looking cheesy (which can be just as fun) or actually having an edge of intensity. 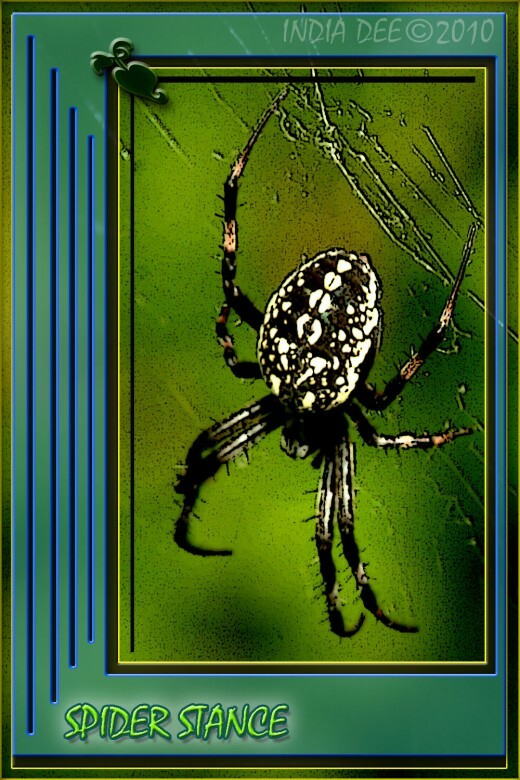 I have chosen ‘Mistral’ as my font style and named the piece “Spider Stance”. 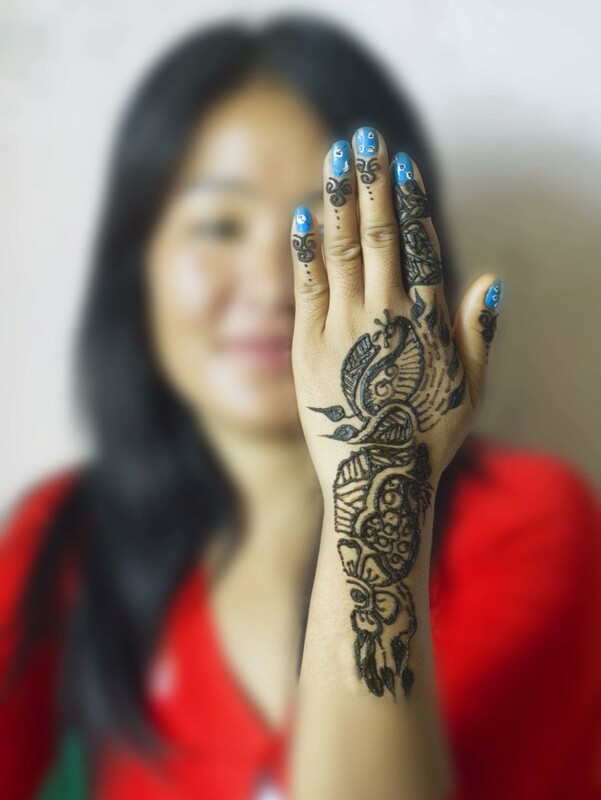 Now you can use this same idea or be creative by coming up with your own (which you should do). As I add my text layer, I want to give it an extra boost of character. To do this, I again use the layer style tools and bevel, drop shadow and color overlay to the text layer. You will have to create your text with the text (T) tool and then change to your ‘Move’ tool (arrow) and restrain the text to modify the layer style. This sounds more tasks oriented than it really is. Be sure to save your work. 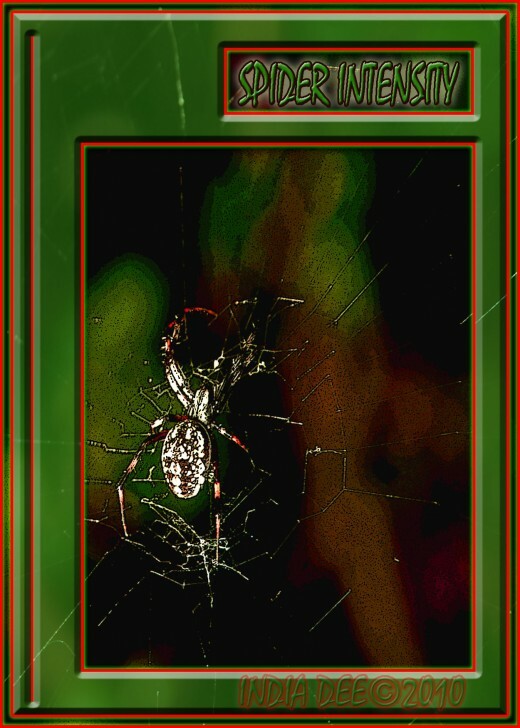 Last but not least, when you have completed your photo Shop Digital Design project from your original snapshot of a spider, be sure to sign it and copyright it if you wish. Save the file to a folder or external removable drive (or CD). Unless you own a 20” X 30” print capable printer, you will want to take your file to a photo lab to have it printed. Or, there are many online print shops for you to choose from and the prices can be very good. If the resale of your Halloween poster is your goal, look for companies that offer a price break at set quantities for the best deals. The 4” X 6” canvas size @ 300+ dpi should allow you to make a pretty nice 20” X 30” quality print of your poster. Again, increased dpi will provide a better quality print at any size. 4 X 6", 8 X12", 12 X18", are a few print sizes that allow an image to be printed free of any unwanted cropping. These are known as "full frame" configurations. It is worth noting that these dimensions for prints are common sizes that usually prevent the image from being cropped. When ordering your prints, you want o make sure you referred to your poster artwork as "full frame" prints. A few common PRINT SIZES THAT WILL CAUSE CROPPING ISSUES ARE 3 X 5", 5 X 7", 8 X10", 11 X 14". Make certain to print your 4 X 6" canvas on a print size that does NOT crop the image, or you will lose a portion of your work, or have a tacky uneven boarder on your custom PhotoShop designs, and that is just never a good look. 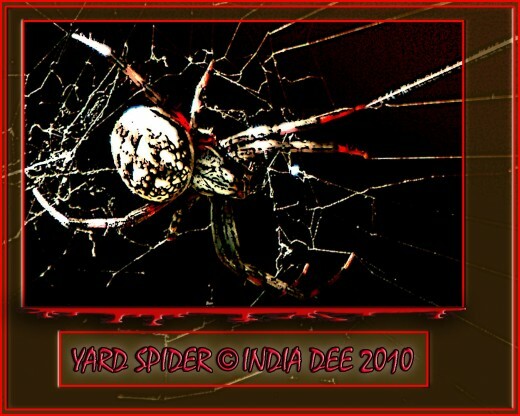 Good luck and have fun creating your own scary “Big Hairy Spider Photo Shop Digital Art Poster” project! 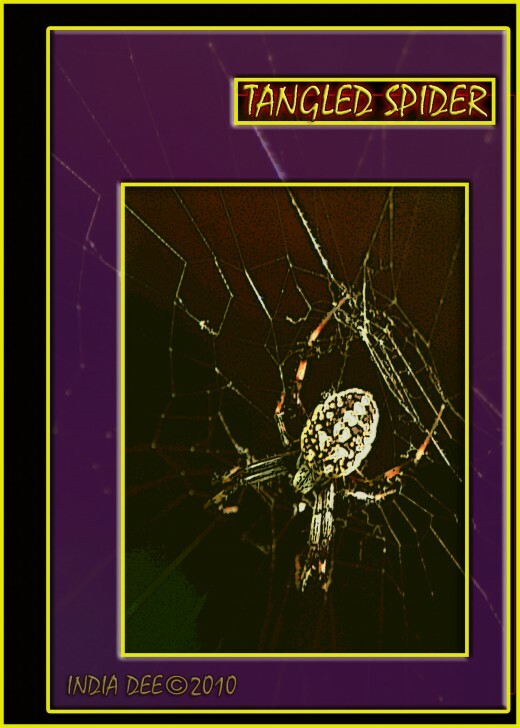 A couple of variations that turn a Spider picture into a "Photo Shop Spider Poster"
There are a lot of amazing photo editing programs on the market, but to the beginner they can seem intimidating. 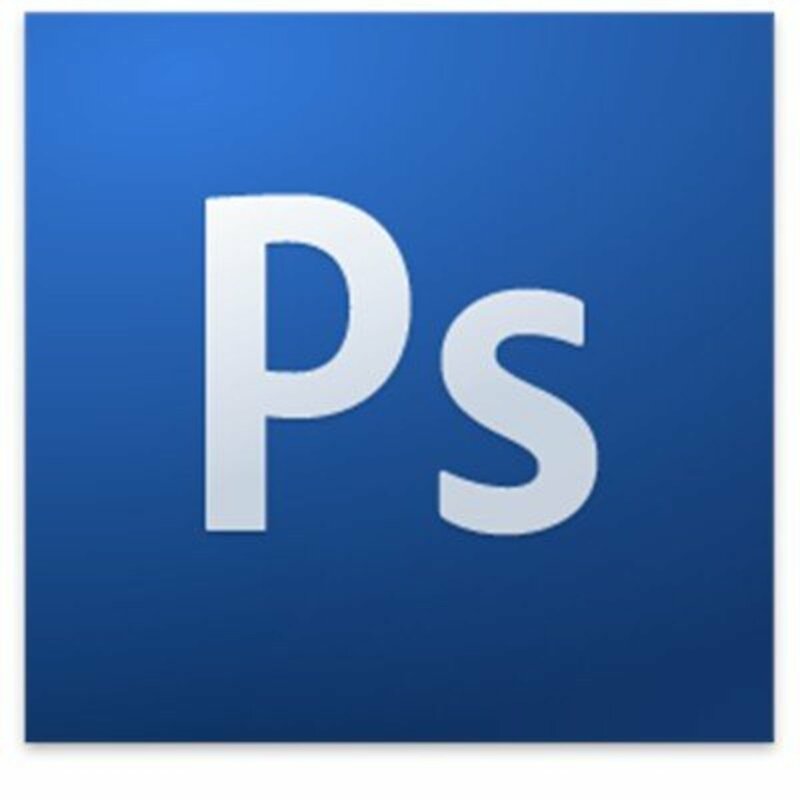 With a few simple steps one can clean up, modify and enhance their digital photos using Adobe Photoshop CS. Comments for "Turn a Photo into a Scary PhotoShop Spider Poster, Beginners PS Guide"
Danprints~ Thanks for the comments, and I really appreciate the tip on googling "poster printing" for options to print out the scary spider posters that get created! That's pretty cool, especially with Halloween coming up! And if you Google "poster printing" you can find many great options for printing them as regular size posters. 7 years ago from Somewhere on this earth..
ketchup101~ I am so glad you found something you can use within this hub. Remember, just have fun and the creative juices will run uninterrupted! Thanks for the read. This is great. Thanks for the tutorial very helpful.. I don't have Photoshop and have heard from some people that it is hard to learn to use. From what you say it is fairly user friendly? Going to bookmark this hub and use it for reference if and when I go ahead and purchase Photoshop. Thanks for the tutorial. Rating it useful! a great and fun way to create digital art, and to pick-up a few bucks if you sell a few. Good luck with the project and I am humbled that you follow. Sweetie Pie~ Thank you for taking time from your busy day to stop by. It was a really fun project and I just can't say enough about the photoshop agility. I appreciate your comment. What a great idea for Halloween, or any day of the year for that matter. wavegirl22~ Outstanding! So glad you found this little photoshop for beginners project to your liking! Thank you for your time and for stopping by, always an honor. K9 - thumbs up. I have scoured the Web for a basic Photoshop tutorial I have bookmarked it and even printed it out for fast reference! Excellent simply excellent. Mickey Dee~ I totally agree with you, PS Movie Maker Programs do require some getting use to. I suggest a one semester Linear-video class at your local community college to get you rollin'. However; I swear by PhotoShop Image software! Sorry you didn't get clear information on the movie program, that is not very cool of Best buy. I'm not very savvy with movie program, otherwise I would offer you pearls of wisdom. I do wish you the best of luck. Thank you for the read and for the comments. Yo K9keystrokes! Man! I wish this was about PS's movie program. I paid $150 or something for it. It was recommended by Best buy but it is user unfriendly. God bless! Money Glitch~ Thank you so much and I love that you are the first! Photoshop has long been a friend of mine and working with digital photography is a joy; combining the two offers me many hours of fun and 'down' time. I am very greatful that you stopped by today, thank you for the awesome comments! rebekahElle~I wish you luck should you give the project a go. The resulting posters can be given as gifts or sold as Halloween props. I appreciate that you took the time to read the hub. Let me know if you have any questions if do try the photoshop stuff! 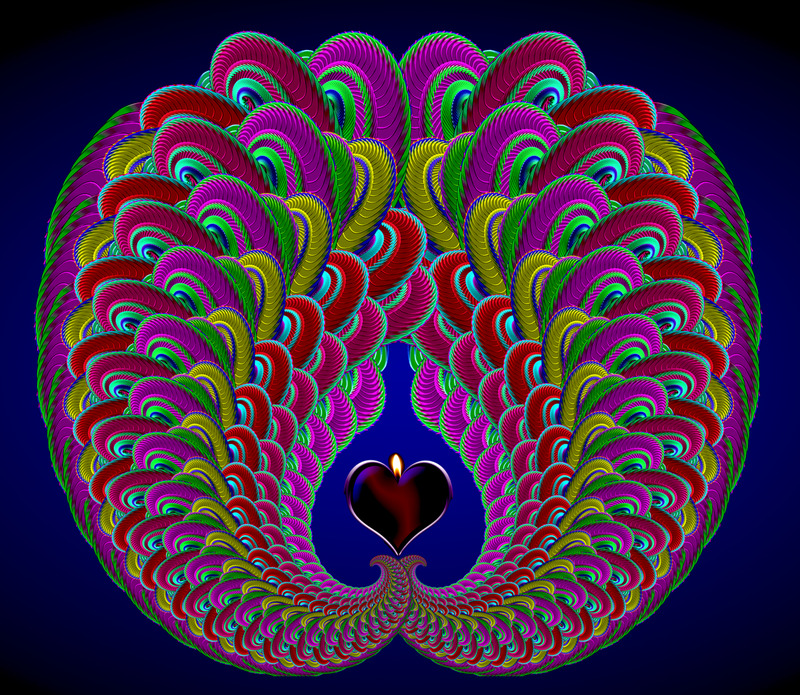 eovery~Thank you for the read, I am honored you take the time to come on over and take in the words. If I had photoshop on a computer where I worked (when I went in to an office anyway) I would have had a lot of overtime! None for doing the job, I am certain I would be playing with PSD files for hours! I hope you have a great time should you try the PS project. rgarnett~I kinda agree with "ick!" when it comes to spiders or other creepy-crawly things. But, with Halloween coming up so quickly, I put on a pair, and went to work on a spider hub. I am a true spider-phobe (the other word for this is to hard to spell).I too, love me some PS. This is pretty basic stuff, but it will hopefully teach a newbie a few quick and easy techniques. Thank you so much for the read! wow, what a great hub, so informative and very helpful! thanks for making it so easy to follow. I'll have to play around with it on my son's computer. This is interesting. I have photoshop at work, but only use for some simple things.